Retired June, 2011 from the Iberville Parish School System with 33 years of classroom experience, Patricia Landry Settoon earned her Bachelor of Arts Degree from Nicholls State University in Thibodeaux, Louisiana. Board Certified by the state of LA in grades 1-8, with a strong background in English and Literature Studies. Pat is 100% pure Cajun, born and raised in Pierre Part, LA, and has lived with her husband, Mertile, for 36 years in Bayou Pigeon. 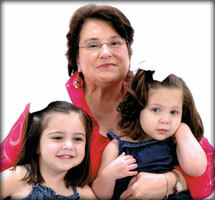 A lifelong reader, she also loves to cook and develop recipes, and spend time with her family. Especially her two granddaughters, Emma and Isabella Blanchard. “Grew up in the small town of Pierre Part, La, and moved to the smaller town of Bayou Pigeon when I married my husband, Mertile “Mert” Settoon. My grandparents, Mabel and Odom “Coke” Hebert lived in Pigeon, so I had many great memories of my visits here. I remember drinking water from the cistern, flitting for mosquitoes at night, and going from house to house on New Year’s Day to get treats. One of the memories that still remains with me today, is Aunt Peline’s large pans of pralines. She always had three, one for coconut pralines, one for peanut butter and the other for pecan pralines. I always wanted the peanut butter ones, and she would let us fill our bags, no one was ever limited. I remember my grandmother mixing one type of batter in a bowl and making crepes, pancakes, and biscuits without ever using any other ingredients, just so all of her grandchildren had their favorite breakfast. My grandfather had the patience of a saint, and anyone who knew him would certainly agree. He once picked fresh okra from his garden, boiled them and brought them to me in the hospital at Oschner’s in New Orleans, because that was the only thing I felt like eating. They just don’t make them like this anymore! I remember going to Mr. Whett Leonard’s Malt Shop, and still today have never had another shake that tasted so good. I think it had something to do with slurping it from a paper straw. Whatever the reason, they were the best, and no one could ever beat them. I would spend time helping my Aunt Ida LeBlanc with the Cake Walk at the church fair, and hanging with our Pierre Part and Pigeon friends at Russell’s Dance Hall. Oh, what great times we had! This is where Mertile and I first began dating and we’ll be celebrating our 36th year together in November. We raised our two daughters Kylie and Megan here and instilled into them the love of family and the legacy of being from a small town. Megan, who now lives in Austin loves coming home to her dad’s homemade biscuits, and mom’s cooking, of which I send plenty to Texas! Copyright © 2011 Clifford LeGrange. All rights reserved.